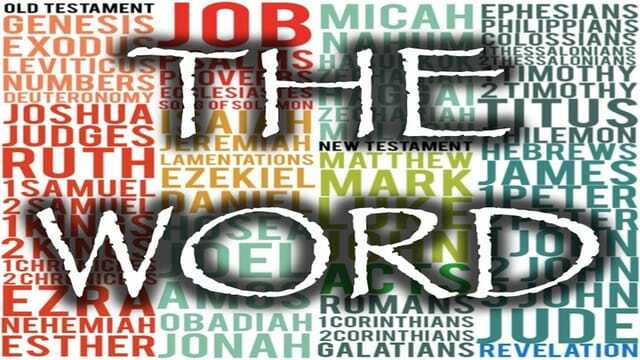 · 39 Books in the Old Testament, 27 Books in the New Testament Scripture is the most impactful document in all of history. · Reveals the Nature of God. Genesis 1:1 In the beginning God created the heavens and the earth. 2 The earth was formless and empty, and darkness covered the deep waters. And the Spirit of God was hovering over the surface of the waters. 3 Then God said, “Let there be light,” and there was light. 4 And God saw that the light was good. Then he separated the light from the darkness. 5 God called the light “day” and the darkness “night.” And evening passed and morning came, marking the first day. Matthew 23:37 “O Jerusalem, Jerusalem, the city that kills the prophets and stones God’s messengers! How often I have wanted to gather your children together as a hen protects her chicks beneath her wings, but you wouldn’t let me. John 1:1 In the beginning the Word already existed.The Word was with God,and the Word was God.2 He existed in the beginning with God.3 God created everything through him,and nothing was created except through him.4 The Word gave life to everything that was created and his life brought light to everyone.5 The light shines in the darkness,and the darkness can never extinguish it. · It was good is expressed in vs 10, 12, 18, 21, 25, 31 states it was very good. Genesis 1:6 Then God said, “Let there be a space between the waters, to separate the waters of the heavens from the waters of the earth.” 7 And that is what happened. God made this space to separate the waters of the earth from the waters of the heavens. 8 God called the space “sky.”And evening passed and morning came, marking the second day. Genesis 1: 14 Then God said, “Let lights appear in the sky to separate the day from the night. Let them be signs to mark the seasons, days, and years. 15 Let these lights in the sky shine down on the earth.” And that is what happened. 16 God made two great lights—the larger one to govern the day, and the smaller one to govern the night. He also made the stars. 17 God set these lights in the sky to light the earth, 18 to govern the day and night, and to separate the light from the darkness. And God saw that it was good. 19 And evening passed and morning came, marking the fourth day. God creates everything. Then begins to define what supports and sustains life. · His plans are GOOD.. but they are HIS plans.